If I only ate one meal a day it would be breakfast. I pay more attention to it than any other meal as it sets me up nicely for the day ahead, which is often filled with all things food related. Eggs feature massively in my breakfasts. I eat an egg in some shape or form nearly every day – love ‘em. 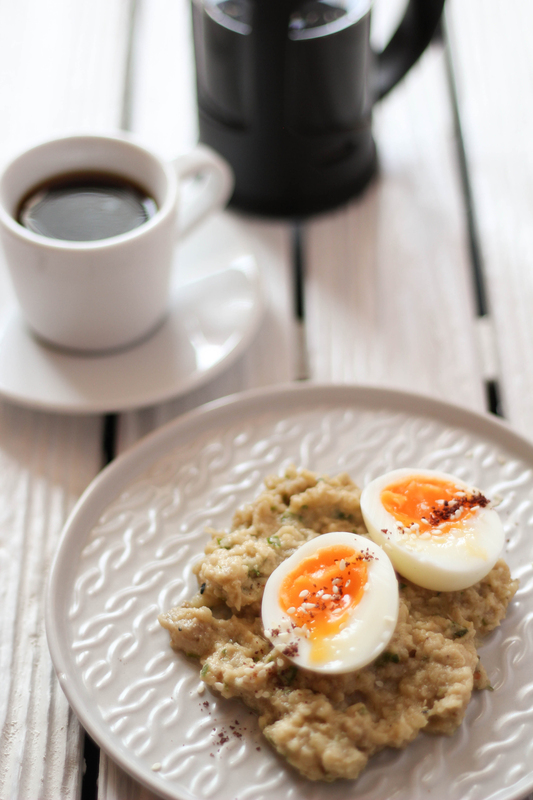 I recently made some Baba Ganoush, had some leftover and paired it with some eggs. And wow, what a combo. Sort of similar to Turkish Eggs, with that nice garlicky hit, but smokey. So so good. Try it! Step 1 Grill the aubergines for approximately 30 minutes until the skin is blackened, turning occasionally to ensure that is charred on all sides. Step 3 Peel the charred skin off the aubergine and mash the flesh into the tahini mixture. Step 4 Boil two large eggs to your liking and peel the shell once cooked. Step 5 Place the baba ganoush in a serving dish, place the egg on top and finish with a sprinkle of sesame seeds and sumac.